Police identified the suspect as Jarrod Ramos, 38, from Laurel, about 25 miles (40 km) west of Annapolis. He faces five counts of first degree murder in Anne Arundel County criminal court where a bail hearing was expected at 10:30 a.m. EDT (1430 GMT) on Friday, The Capital Gazette newspaper group reported. 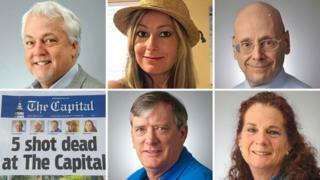 He is accused of entering the Capital Gazette office on Thursday afternoon with a legally purchased pump-action shotgun and opening fire through a glass door, hunting for victims and spraying the newsroom with gunfire as reporters hid under their desks and begged for help on social media, police and witnesses said. Rob Hiaasen, 59, Wendi Winters, 65, Rebecca Smith, 34, Gerald Fischman, 61, and John McNamara were shot and killed. All were journalists except for Smith who was a sales assistant, police said. After the shooting, police in Baltimore and New York City deployed extra officers outside major media outlets as a precaution.